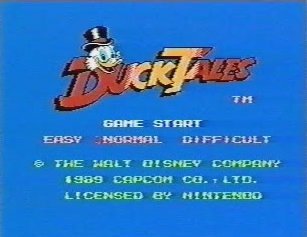 This September 1989 adventure game follows Scrooge McDuck through five stages on his quest to become the richest duck in the world. Bounce around on his cane to tackle foes and break open treasure chests. Best Difficult mode time: 0:07:25 by Daniel 'Dxtr' Eriksson on 2012-09-15. Best Difficult mode time, European version: 0:08:10 by Johan 'segasonic' Grape on 2011-07-07. Difficult mode: 0:07:25 by Daniel Eriksson. This is, if I may say a great run! Moonglitch went beautiful, rat couldve cooped abit more! Transylvania: Thank you Magicka for not being a jackass! Cave + key: Almost no RNG at all! Duckula: Lost some time walking to Duckula, the fight itself went good. He couldve spawned nearer and been killed faster. BIG shoutouts to Bangerra for some of his strats. Couldnt done it without you. Difficult mode European version: 0:08:10 by Johan Grape. The bossfight went perfect, it isn't easy to read that crazy rat! The glitch could be performed a little bit tighter. "This level goes pretty well. Could have done a little bit better by not stopping in between those flowers for an instance (in the beginning), but I did that to ensure I would make the jump. The hit I get slows me less down then you might think, because otherwise I'd have to stop for a second to avoid that 2nd flower. Still took more time then it should have." Couldn't agree more! My bossfight went terrible though, I lost at least two seconds when the boss suddenly decided to jump. Screwed up the jumping in the beginning a little bit. The boss went pretty well. Luckily she didn't fly all the way up high. This level can still be improved. The level itself went perfect, the boss was also pretty nice. Could have done the last attack a little bit tighter though. Almost perfect. It's possible to hit the boss with some tighter moves, the level went very good. This level and the boss went very good. The last jump could've been timed a little bit better. I reached my goal, which was to beat Giel Goertz, he is a great speedrunner! This run isn't perfect, it's possible to knock off atleast five seconds, but I doubt that is possible for a human to do.